In the latest sign of hard times for traditional retailers, Macy’s will close its Northgate Mall store in early 2020. Rumors of the closure were confirmed Tuesday by spokeswoman Justine Jordan, who also confirmed a recent report that its store in Redmond Town Center will close early this year. “The decision to close a store is always a difficult one, but Macy’s is delighted to have served the Redmond community over the past 16 years and the Seattle community over the past 70 years,” said Jordan in an email. Macy’s has already informed employees at both locations of the closure plans, Jordan said. Employees whom the company can’t place at nearby Macy’s stores “will be eligible for severance, including outplacement resources,” she added. The Northgate closure marks a somber milestone for the Seattle mall. The mall’s “anchor” tenant, when it was founded back in 1950, was The Bon Marché, which became Macy’s in 2003. Last October, another Northgate anchor tenant, J.C. Penney, announced it would close in 2019. “It feels like we’re losing our middle-class shopping,” said Julie Carr, an area resident who heard about the closure from a Macy’s employee at Northgate last weekend. As part of that disruption, Macy’s has been undertaking an ambitious downsizing since 2016, when the 165-year-old retailer announced plans to shutter 100 stores and invest the cost savings in a strategic shift toward online and mobile shopping. Macy’s has also been “reviewing its real estate portfolio across the country to see if there are opportunities to improve the use of our assets,” Jordan said. By the end of 2017, Macy’s had closed 81 stores, with 11 more closures planned for 2018, according to CNBC. Last year, its downtown Seattle store — a block-size building in the heart of downtown — was reduced to a couple of floors. The rest of the building was converted to office space and leased to Amazon. Last week, Business Insider reported that Macy’s intended to close eight more locations, including the Redmond store, in 2019. News of the Northgate closure comes as the mall’s owner, Simon Property Group, is preparing for a wide-ranging redevelopment of the mall. 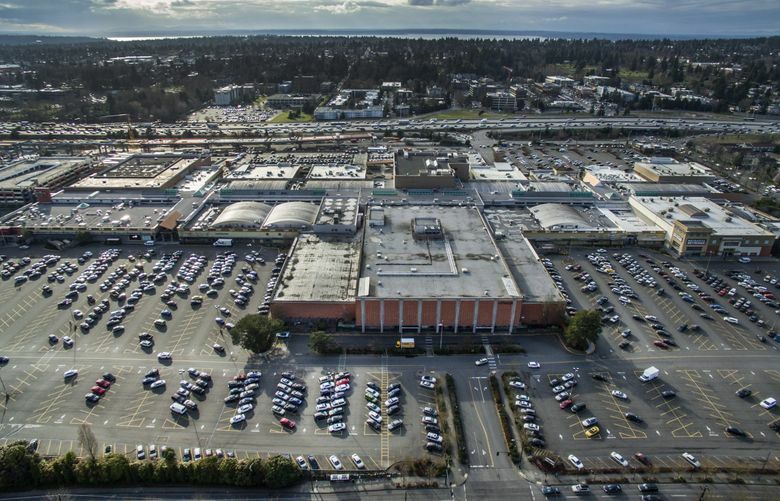 The project, which is still in the permitting process, would keep much of the mall’s retail function, but would add housing, office space and a training center for Seattle’s new National Hockey League team, according to project plans. The redevelopment will be rolled out in three phases, and may not be completed until 2029, according plans submitted by Simon to the Seattle Department of Construction and Inspections. The city department, which is almost done with an initial review of project plans, will hold public design reviews on February 25 and April 8. In the meantime, Macy’s shoppers can look forward to a clearance sale at the Redmond store that will run from mid-January to the end of March. And Macy’s “customers can also always find us online at macys.com,” said Jordan, the Macy’s spokesperson, in a clear nod to the company’s growing emphasis on virtual retail. That’s unlikely to mollify longtime Macy’s shoppers, if reaction to Tuesday’s news is any indication.